Who is a God like you, pardoning iniquity and passing over transgression for the remnant of his inheritance? He does not retain his anger forever, because he delights in steadfast love. 19 He will again have compassion on us; he will tread our iniquities under foot. You will cast all our sins into the depths of the sea. 20 You will show faithfulness to Jacob and steadfast love to Abraham, as you have sworn to our fathers from the days of old. We have been spending some time among the Old Testament prophets. God gave us the messages of the prophets because their messages were intended to outlast them. 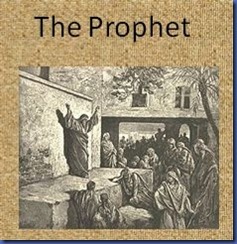 The Old Testament poetry expressed the heart of the people of God, but the prophets expressed the heart of God. They showed God’s reaction to the world that he created. We should expect to get a clear picture of what God is like by reading the prophets. Nowhere is that more obvious than the writings of Micah. 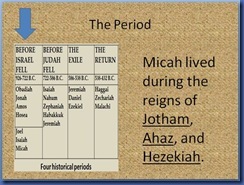 Micah can be dated from “probably before the fall of Samaria in 722/21 B.C. to Sennacherib’s march to Judah in 701 B.C.” The prophet Micah lived during the times of three kings of Judah–Jotham (750-732/35), Ahaz (735-713/16), and Hezekiah (716-687) (David Malick). That makes Micah a lesser known contemporary of Isaiah. He was probably quoting Isaiah 2 in his mountain prophecy of Micah 4. Both prophets spoke for God during a time when the nations all around Judah were gaining prominence. It seemed like God’s people were in danger of being lost. The mountain prophecies encouraged God’s people to live by the light of his word, because some day all the nations would come to Jerusalem to be taught God’s word. This was also a time of warfare and bloodshed, but both prophets spoke of a time of peace, when the weapons of war would be turned into instruments of agriculture. Micah concludes his prophecy by highlighting one characteristic of the LORD. It is his steadfast love (18,20). This is that special term chesed that I have mentioned before. It refers to God’s loyalty to his covenant people. I think that God had this word in mind when he instructed his people to make a sign on their doorposts at the Passover. That sign would look like the Hebrew letter Chet, which is the first letter in Chesed. Micah proclaimed that God’s steadfast live is like the Passover. He forgives our sins by passing over them because of the blood of the Lamb. That Passover lamb represented Jesus, the Lamb of God, who takes away the sin of the world. 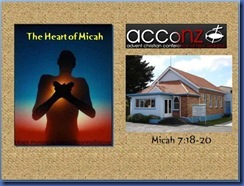 Micah also predicted that God would again have compassion on his people and tread their iniquities under foot. The picture, I believe, is that of the conquest, when God went before Israel and gave them victory over their enemies. But the enemies of which Micah speaks are sins. These are our true enemies. There are three categories of sin: 1) transgressions, 2) sins against conscience, 3) sins of omission. God loves us so much that he does not want to just pass over our sins, he wants to defeat them – to tread them under his feet. This life – this Christian life – is the time in which he wants to do that for us. Micah proclaims that God’s steadfast love will yet do one more thing to put an end to sin in our lives. He will cast all our sins into the depths of the sea. I think Micah is harking back to the time when Israel was leaving Egypt and they were being pursued by Pharaoh’s armies. God drowned the enemy’s troops in the Red Sea, but let his people pass through the Sea. Casting sins into the depths of the sea is a way of getting rid of them forever. 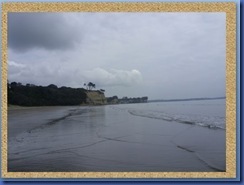 They are not on the shore for us to see again every low tide. They are drowned, forgotten, forgiven. This is what God is going to ultimately do for us. 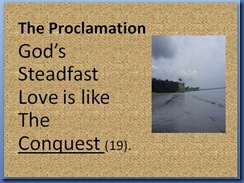 What has God’s steadfast love done for you today? Perhaps you are here today, and you cannot even say that you know that you are forgiven. You can have forgiveness today, and you don’t have to do anything for it. Christ was the Passover lamb. Accept God’s forgiveness today. Perhaps you are here today, and you have been struggling with some personal sin. God wants to tread your iniquities under his feet. Give him free reign over your life, and let him defeat your real enemies. Perhaps you have some regrets. You know you are forgiven, and you no longer commit those sins anymore, but you just can’t quite forgive yourself. God wants to take those sins and drown them in the depths of the sea. LORD, we want to experience the fullness of your grace today. For those of us who have never come to you before, give forgiveness. For those of us who are struggling with personal sins, give us victory. For those of us who are hanging on to past regrets, give us the courage to forget what you promised to forget. There is no God like you, LORD. Thank you for your steadfast love.